Cost: $75 to $220 ($40 to $110 for replay) depending on season and $55 plus tip for optional caddie. 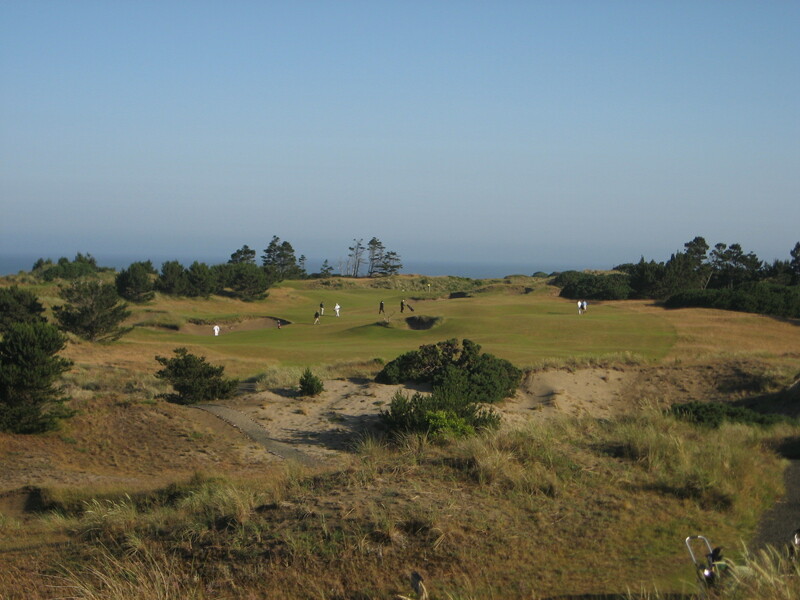 Pacific Dunes was the second course to open at the Bandon Dunes Golf Resort, in 2001. Tom Doak, and the team at Renaissance Golf Design, knew that Mike Keiser had handed them one of the most spectacular sites for a golf course in the past 50 years. 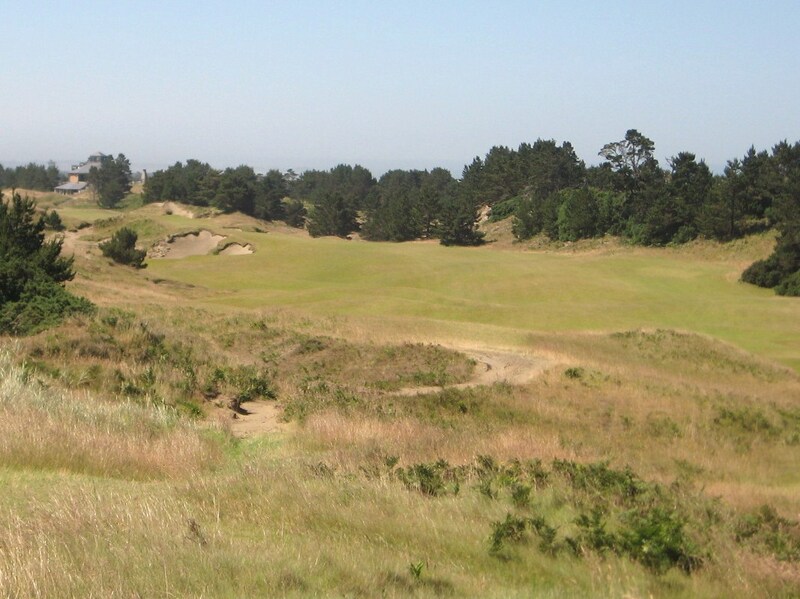 The property exceeded the one found next door at Bandon Dunes, which meant the playing experience should be superior as well, and it is. 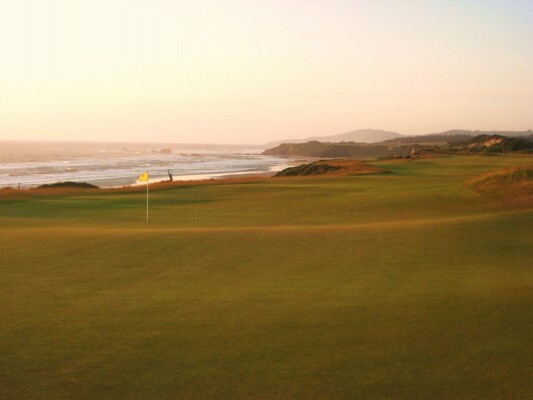 When you step up to the first tee at Pacific, you are expecting to play a round at one of the top courses in the WORLD, based on golf magazine rankings and popular opinion. While that is a lofty expectation, I was not disappointed. 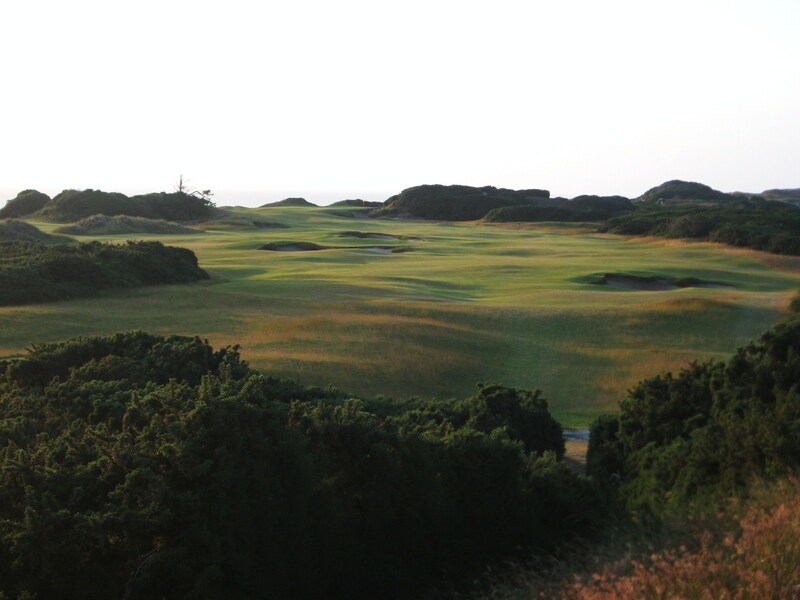 Pacific Dunes is a thoroughly enjoyable walk. 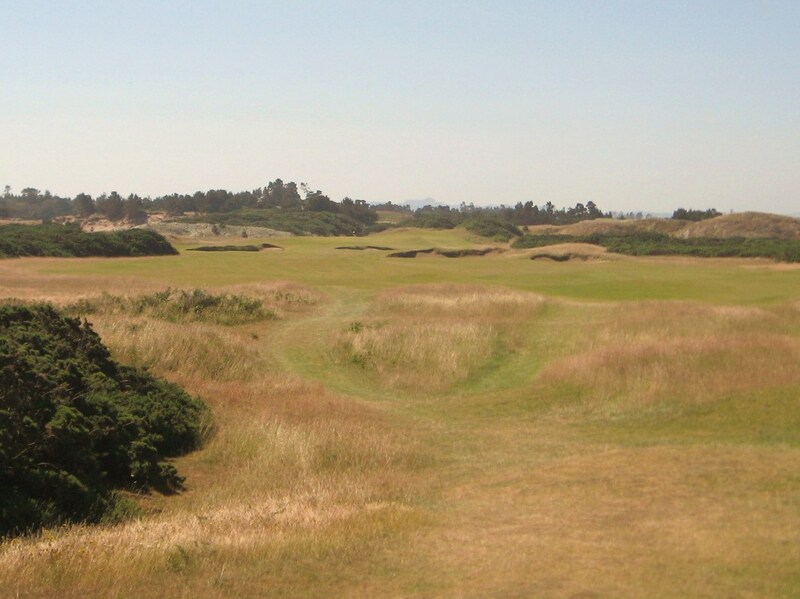 The routing of Pacific Dunes is strong and it is difficult to find a hole that was not thoughtfully designed. 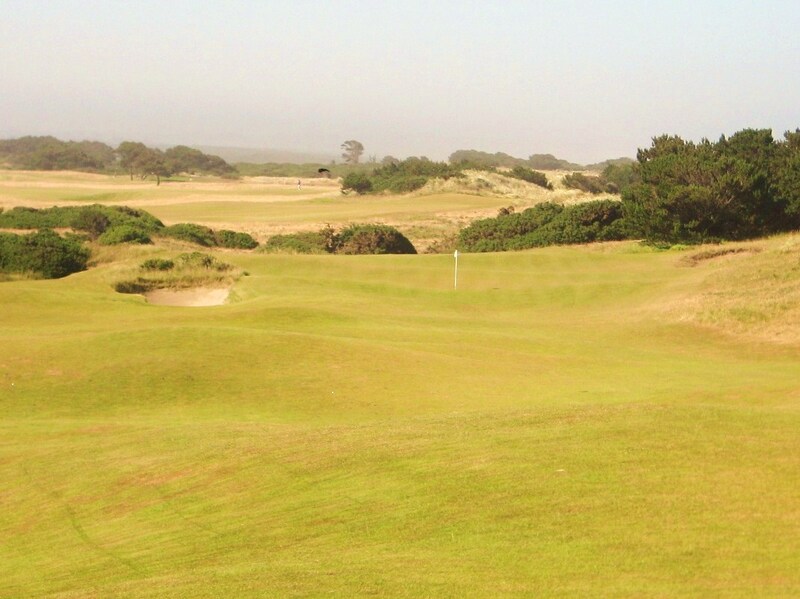 As at Bandon Dunes, the holes along the coast are amazing, while many others are routed so the ocean is visible in the distance which is a nice aesthetic touch. 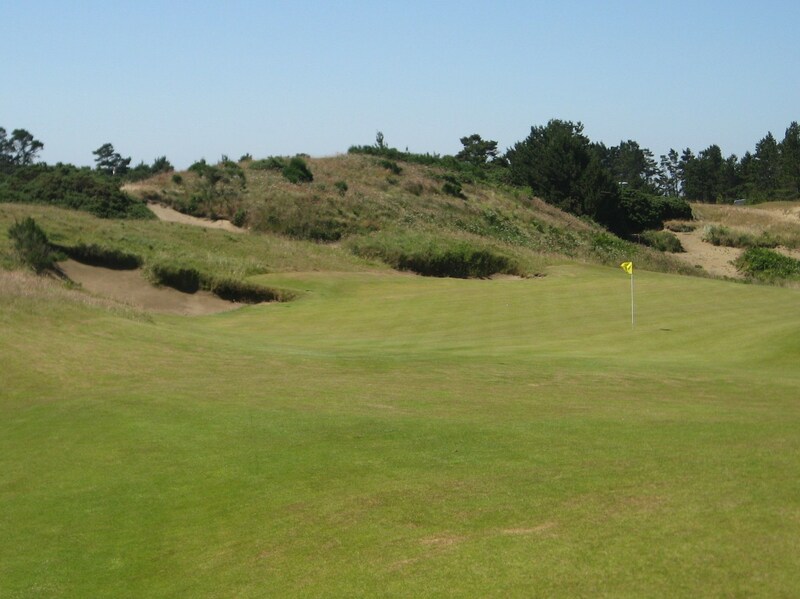 As at Bandon Trails, the green complexes are exquisite, challenging and a lot of fun to play. 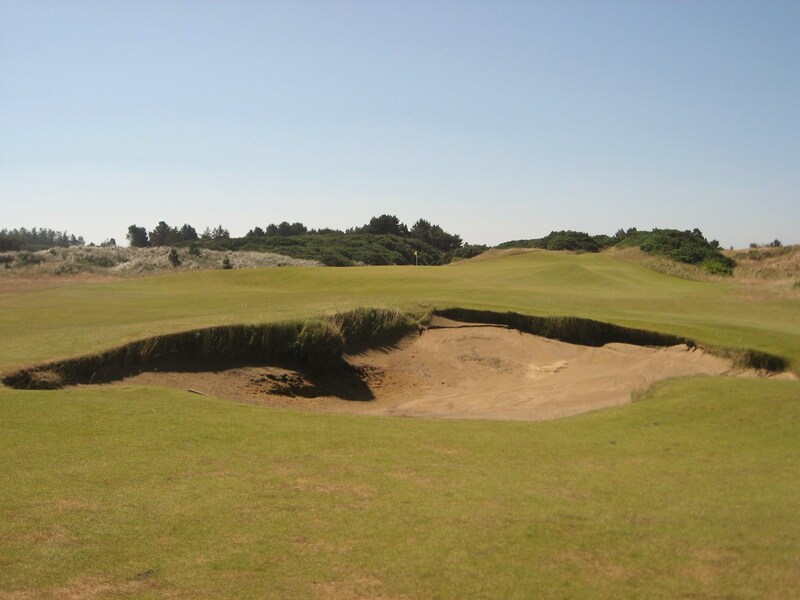 The bunkers at Pacific Dunes have a very natural look that blends perfectly with the undulating greens and fairways found throughout the course. 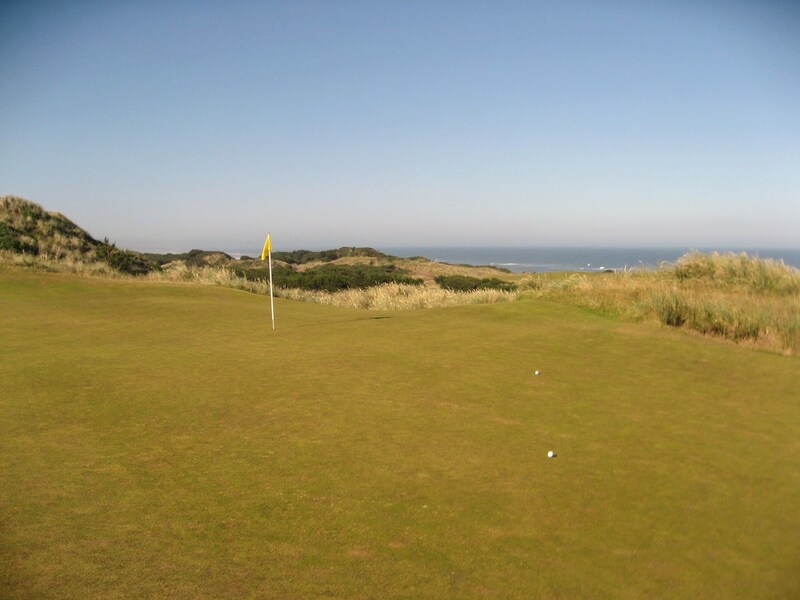 I was fortunate to play Pacific Dunes twice on my visit, and the conditions were very different. The first round was probably in 10 to 20 mph winds, while the second was in 25 to 40 mph winds. Needless to say, the harder the wind blows the more challenging the holes become, especially those on the bluff. How intense is a 40 mph wind? On the thirteenth, I had the brake engaged on my push-cart, and the wind still pushed it about twenty yards back down the fairway while I was hitting an approach shot. On the seventh, the cart was literally pushed over onto its side, something I had never seen before. What is a round of links golf without the wind?!? 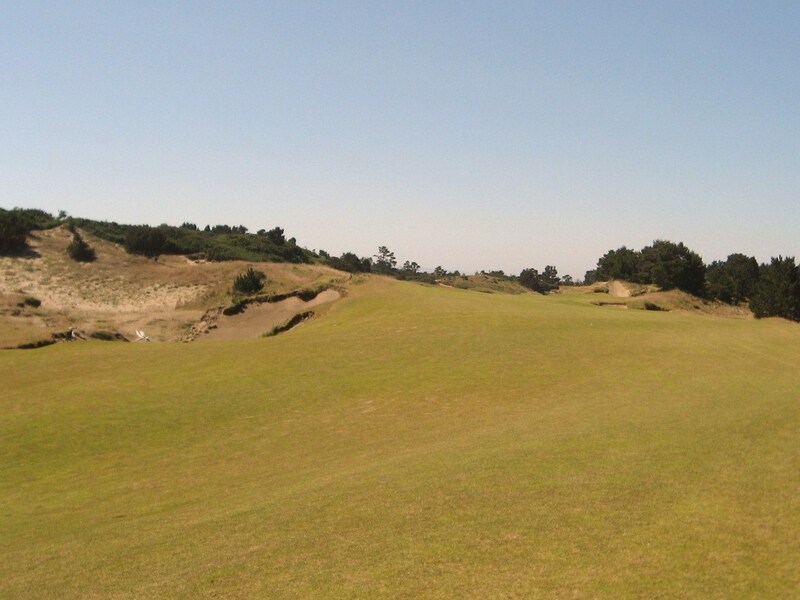 The first hole at Pacific Dunes is relatively straight-forward. Depending on the wind, it could be a fairway wood or a long iron off the tee to a generous landing area. 1st Tee at Pacific Dunes. 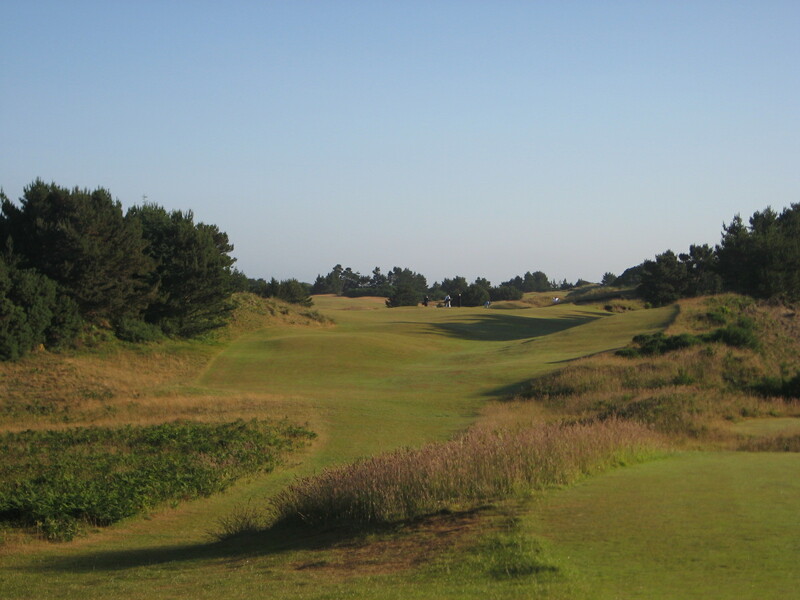 The rumpled fairway can present a wide range of lies for the approach. 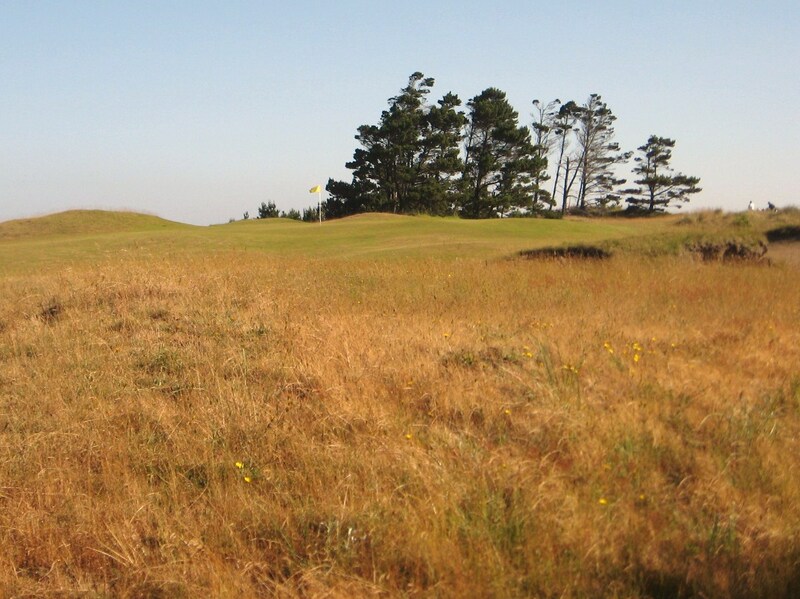 This is a common theme at Pacific Dunes which is one element that makes it so enjoyable to play over many rounds. The approach needs to clear the mound in front of the pin, and release onto the green. 1st Approach at Pacific Dunes. For golfers who are used to playing courses with wide open green complexes, the mound presents a significant challenge in judgment as it skews the sight line and can deflect mis-hits. Although the mound is a small feature, it adds a great deal of interest to the hole. These small touches on the fairways and greens occur repeatedly throughout the round at Pacific Dunes and truly enhance the challenge and playing experience of the course. Short of 1st Green at Pacific Dunes. There is some room beyond the mound to run a ball onto the green, but the golfer must be careful of pushing the approach left, into the bunker, or two far right, into an Environmentally Sensitive Area. 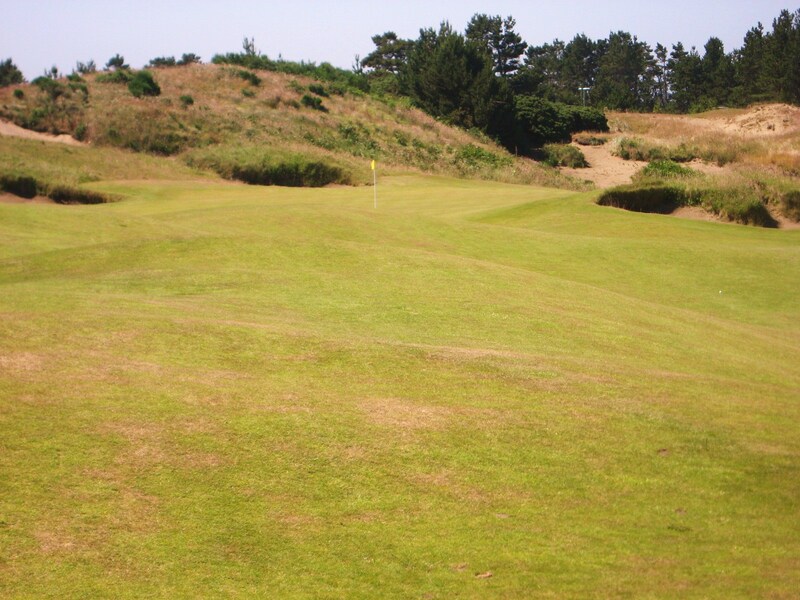 The putting surface challenges the golfer with subtle movement and a back to front slope. In terms of conditioning, note how seamlessly the fairway merges with the green to make the two almost indistinguishable. Spectacular work by the course super and his team. 1st Green at Pacific Dunes. 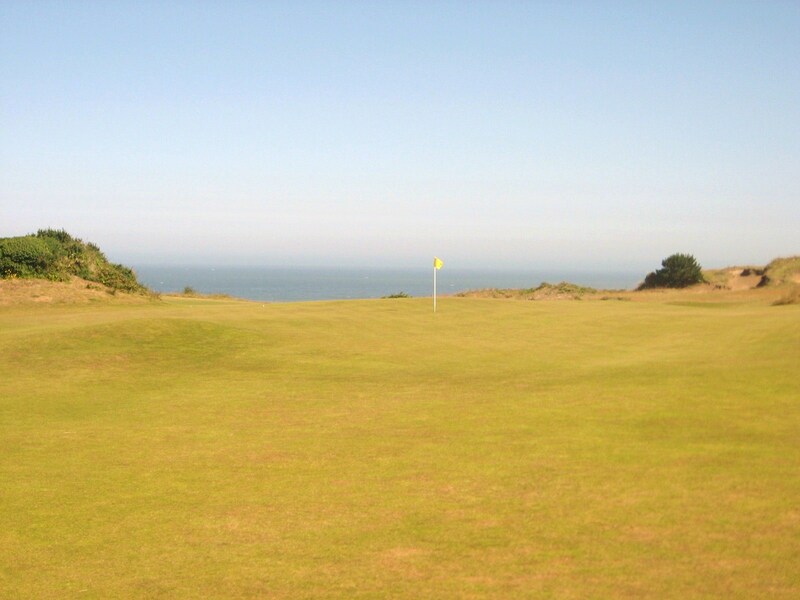 At the second, the golfer turns towards the ocean and gets a glimpse of it in the distance. 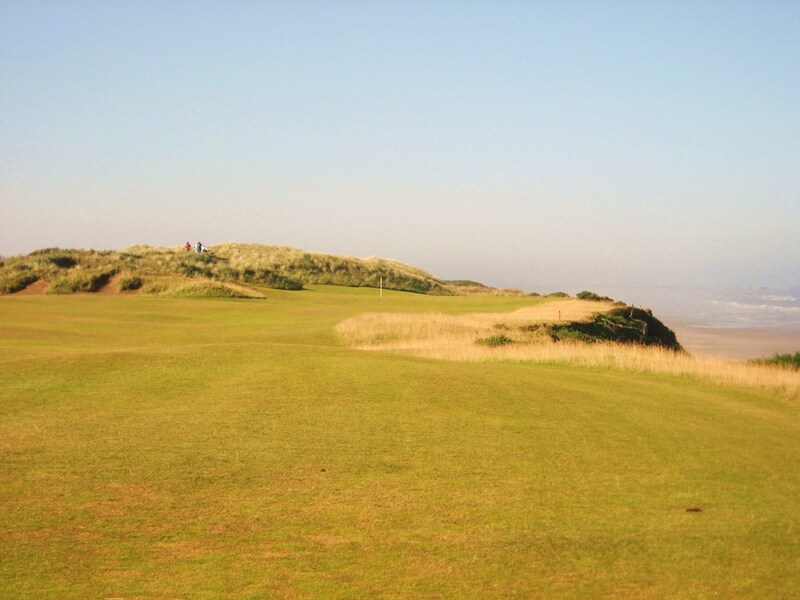 The undulating fairway also contributes to the ocean motif as waves of green are evident from the tee. The “Shoe” bunker in the middle of the fairway is a good line for your drive if you can carry it. The bunker fronting the green, and the open side on the left of the putting surface, clearly communicate that the ideal approach would be from the left side of the fairway. 2nd Tee at Pacific Dunes. The green has a backstop that can be used if necessary. Anything long is trouble as any ball that crosses the ridge has to come back over it onto a green that slopes towards the front. An up and down from the bunker fronting the green on the right is not an easy task either. 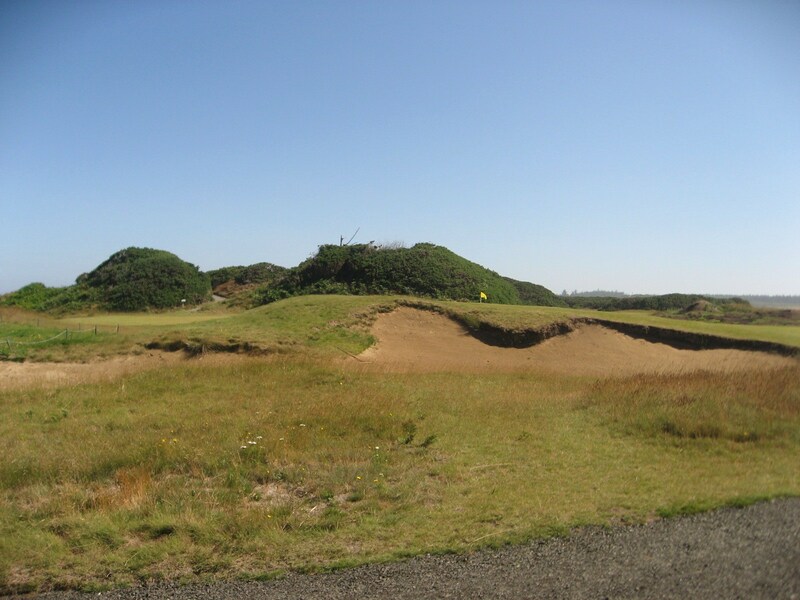 Note how the design of the bunker blends naturally with its surrounds. Second Green at Pacific Dunes. The march to the Pacific is almost complete on the par five third which is a beautiful hole. 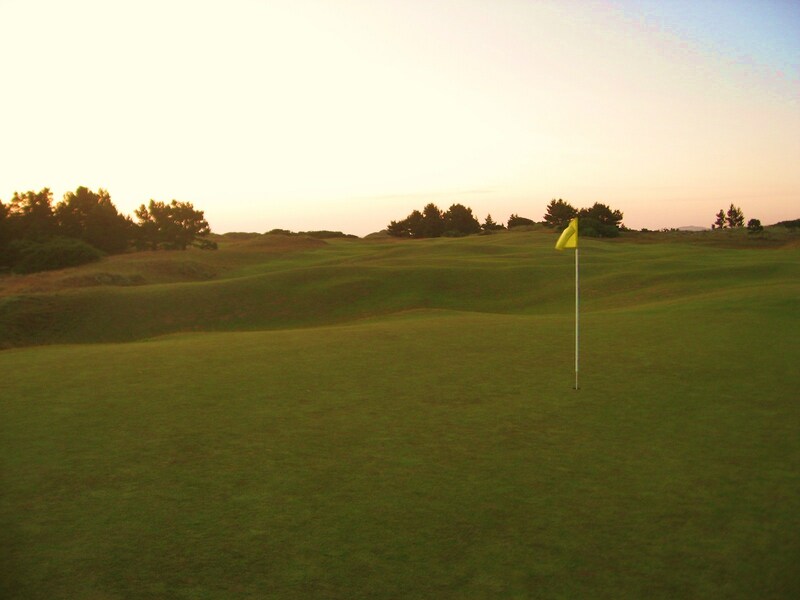 The twilight picture below illustrates the many subtle undulations that exist on the fairway. Depending on the wind, some of the fairway bunkers can be carried so check your yardage. There is room on the right side of the fairway, but the left provides a better angle into the green. 3rd Tee at Pacific Dunes. 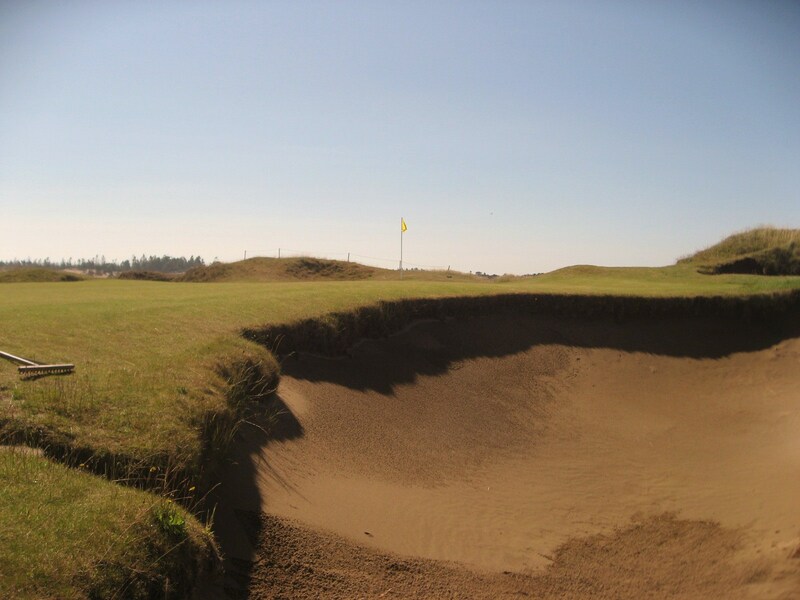 The first bunker below can usually be carried off the tee, so it is important to play either left or right of the second bunker located about forty yards behind. Fairway bunkers at Pacific Dunes 3rd Hole. A layup just short of the green must avoid the large and deep bunker on the right side of the photo below. There is a runoff area on the left side of the green which can leave a difficult chip to the pin. 3rd Green at Pacific Dunes. This is an “all-world” two shotter that plays along the bluffs above the Pacific Ocean. The tee shot should be played towards the fairway bunkers on the left, although having a second from the center or right side of the fairway is easier. 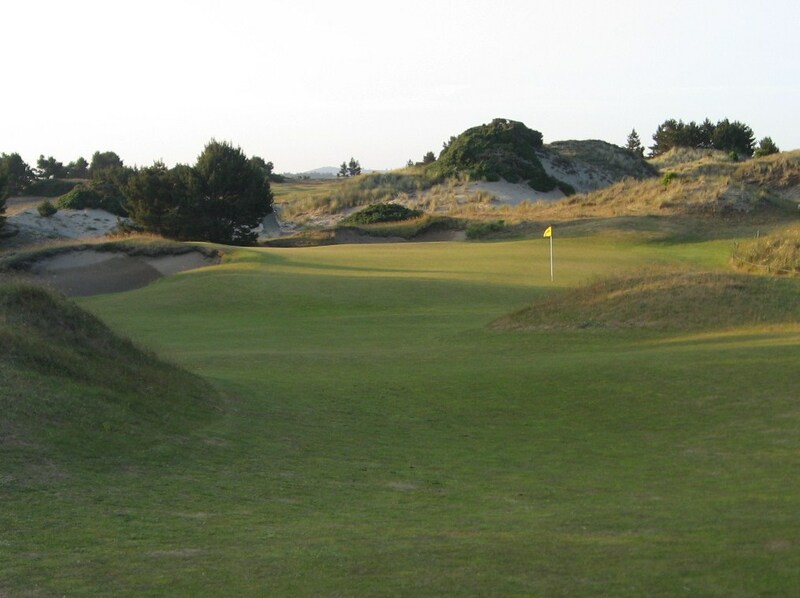 An approach from too far left must avoid a huge bunker, as seen in the photo below, while also carrying just past the mound on the left side of the green. If the approach is coming in too hot, it can easily land, kick right, and run off the green to the beach below. From the center or right side of the fairway, the pin should be attacked on the left, because your ball will move right once it lands. 4th Approach at Pacific Dunes. A closer look at the green shows how it is tiered into two levels and slopes from left to right. The mound is also nicely positioned to hide the putting surface from any golfer who bails out too far left off the tee. 4th Green at Pacific Dunes. The fifth can be a daunting one shotter even though it is one of the easier holes on the course. The summer wind is likely with the golfer so the ball will certainly roll after landing. The slope to the left of the green, in front of the bunker, provides a nice landing area which will kick the ball onto the putting surface. The depth of the bunker on the right side of the green is illustrated by the morning shadows. 5th Tee at Pacific Dunes. The two well placed tee shots below have difficult putts for birdie. 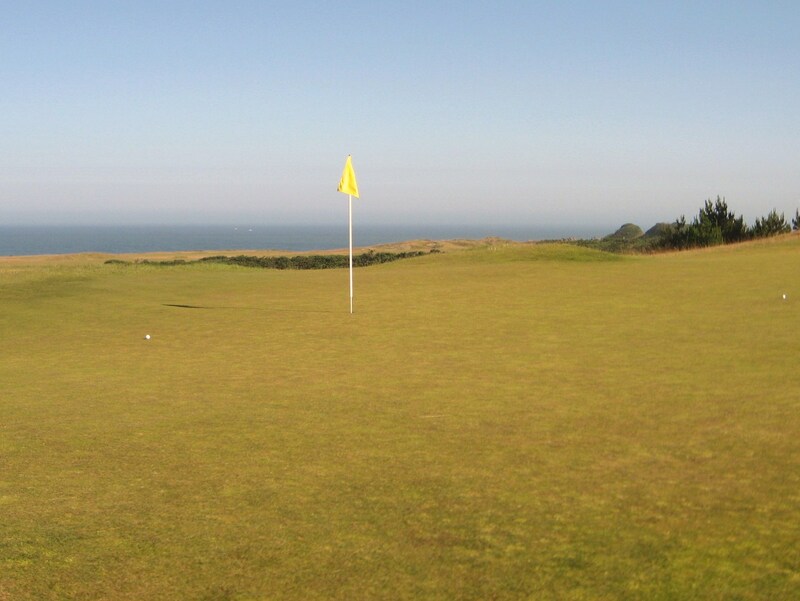 The green has two tiers and enough movement to make any putt a challenge. Notice that while we are not on the bluffs anymore, the ocean is still visible. 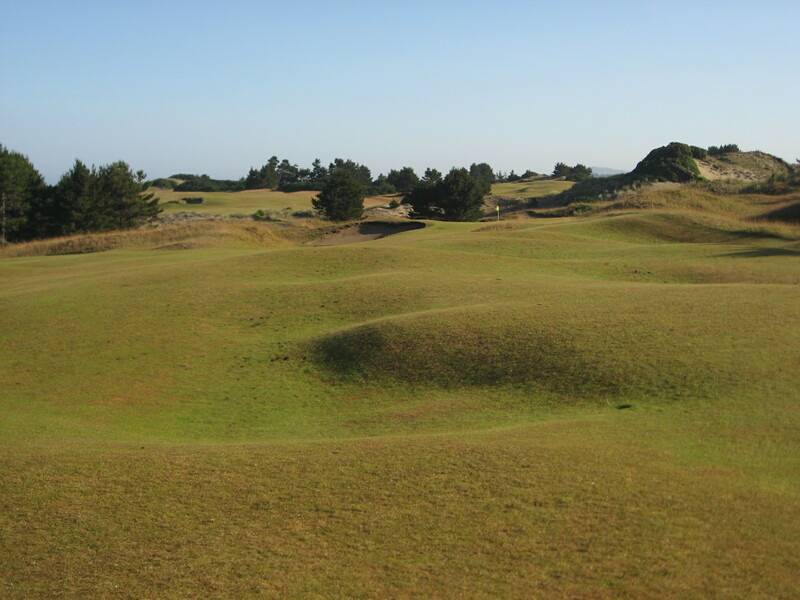 Unlike most of the inland holes at Bandon Dunes, the ones at Pacific often have site lines to the ocean. 5th Green at Pacific Dunes. The sixth is short on distance but long on challenge due to the myriad of strategic elements that are in play, especially on the approach. Depending on the wind, and the player, there are a couple options off the tee. A Driver long and right provides a good angle into the green, although a well placed iron just over the trap can provide a better approach as the green is long and narrow. 6th Tee at Pacific Dunes. The thin and hidden green and the two large blow out bunkers on the left and a sharp fall off to the right only add to the golfer’s blood pressure on the approach. 6th Fairway at Pacific Dunes. The bunkers on the left side of the sixth green are magnificent and unrelenting. A shot into either of them will leave an almost impossible blast up to the green. 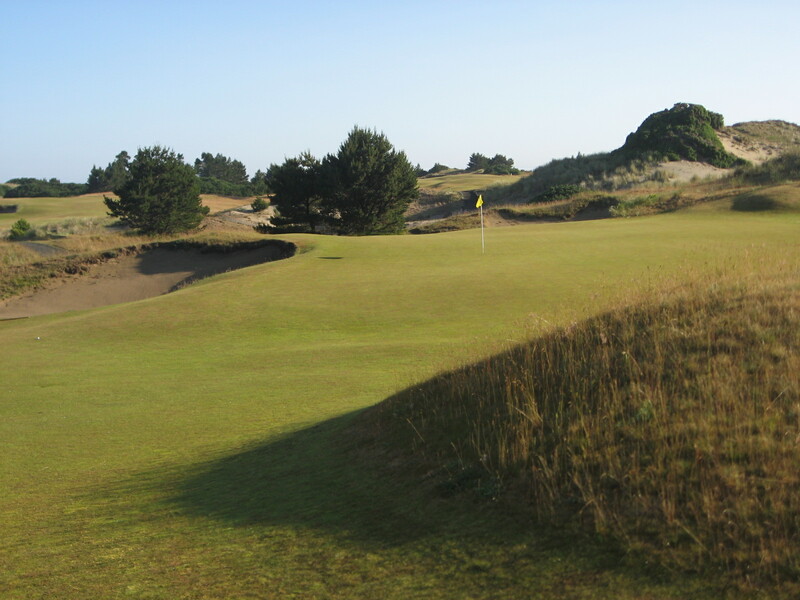 Bold design features such as these only add to the quality of Pacific Dunes. Blow out bunkers left of the 6th Green at Pacific Dunes. From the right side, a pushed drive might be in the fescue, but the angle to the pin is good and there is a bit of a backstop so it is not a bad miss off the tee. 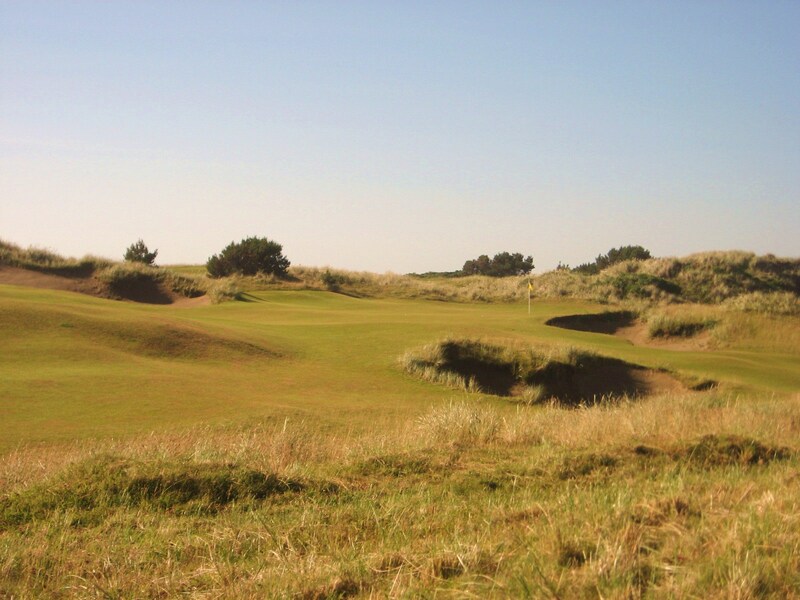 Approach to the 6th Green from the Fescue. The two putts below were for birdie which is probably a rare occurrence on this hole. 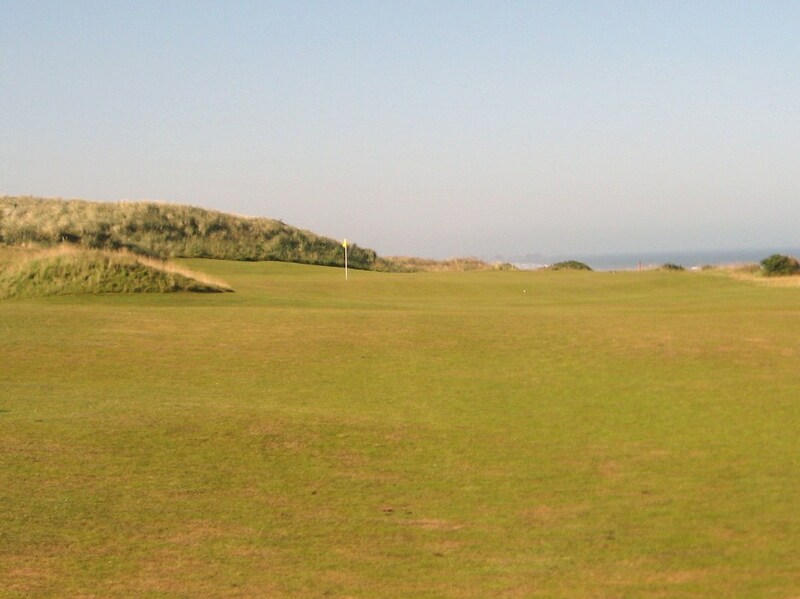 Once again, the green provides a lovely view across the course and out to the ocean. 6th Green at Pacific Dunes. A good drive is important to provide a chance for par on the two shot seventh. If you can play up the right side, it will leave a reasonable approach to a challenging green complex. 7th Tee at Pacific Dunes. 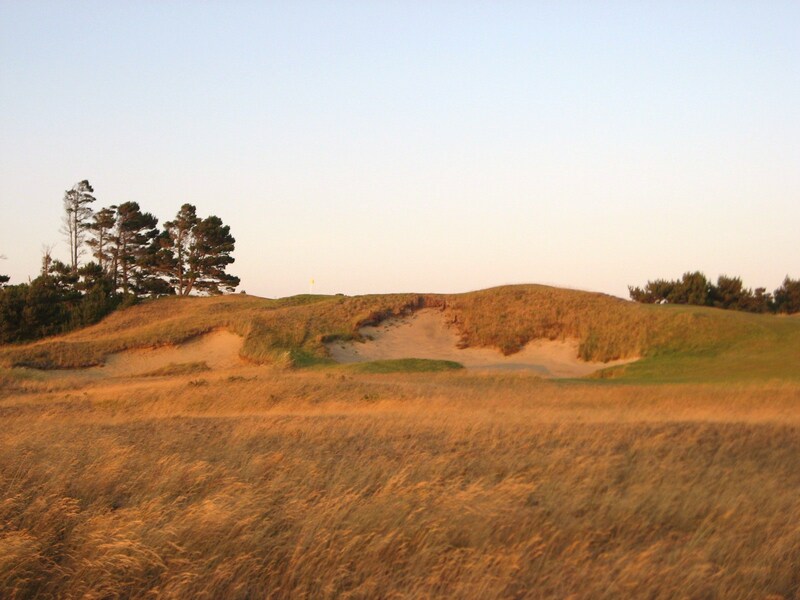 There are a series of mounds and a deep bunker that begin about 85 yards short of the green which can make the approach visually intimidating. There is also a string of deep bunkers up the left side that begin seventy yards from the green and run along the putting surface. A good drive and an iron to the middle of the green is probably the best play regardless of pin position – get your four and move on to the next hole. 7th Fairway at Pacific Dunes. 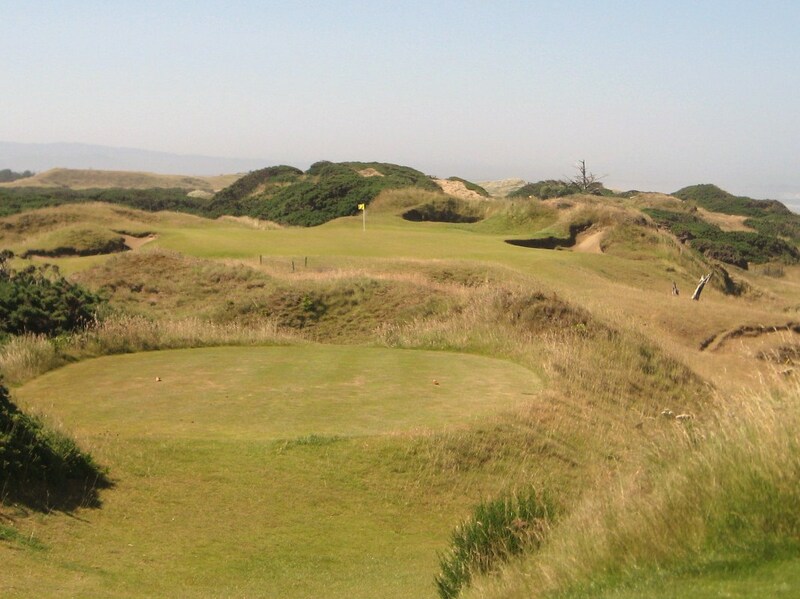 The eighth plays into the wind during the summer which can make it a pretty long par four. I really like the strategy of the hole because although there is a wide fairway, an approach from the left side provides a much better look at the green. Anything right will require a blind fade that must avoid the pot bunker in front of the putting surface which has a massive impact on play. 8th Tee at Pacific Dunes. If you can navigate your approach past the cheeky bunker pictured below, then a tricky birdie putt awaits on this wildly undulating green. 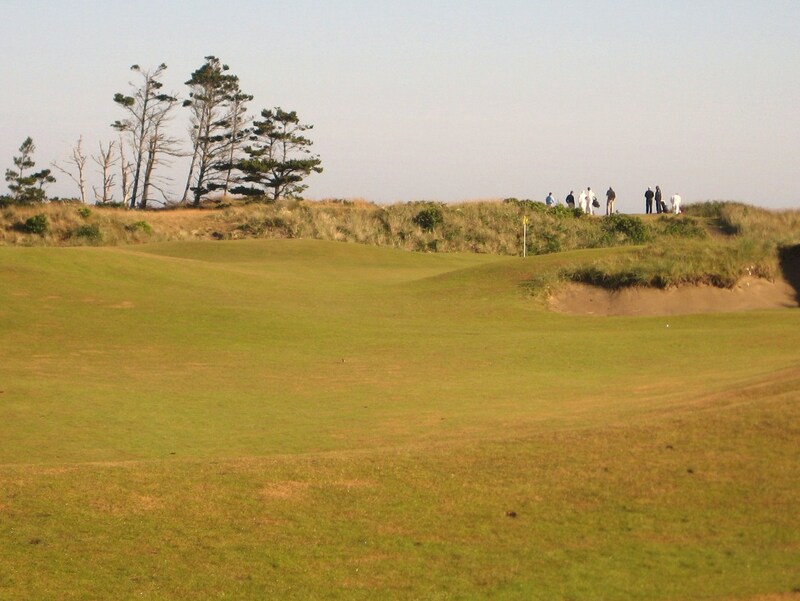 8th Green Complex at Pacific Dunes. 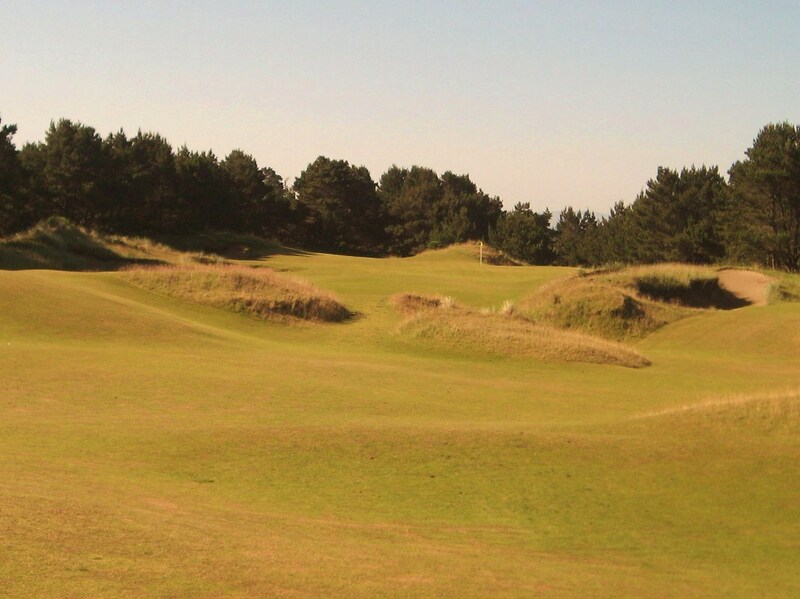 The ninth is a unique hole because there is an “upper” and a “lower” green, and the golfer finds out which “hole” to play on the tee. I only had an opportunity to play the lower. The tee shot to the lower green is the most heroic on the course as a carry of almost 200 yards is required to make it to the short grass. A huge drive can reach the green but will more likely finish around fifty yards short after getting a long run out down the side sloping fairway. 9th Tee at Pacific Dunes. 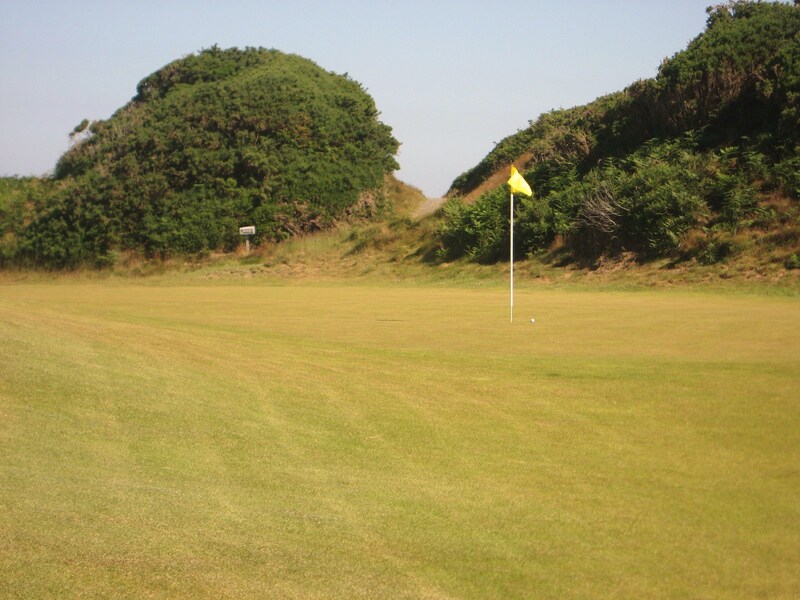 When a drive puts you just short of the green it is impossible not to think about an easy birdie, but this green is no pushover because it has significant undulation and a bunker tight to the left side. 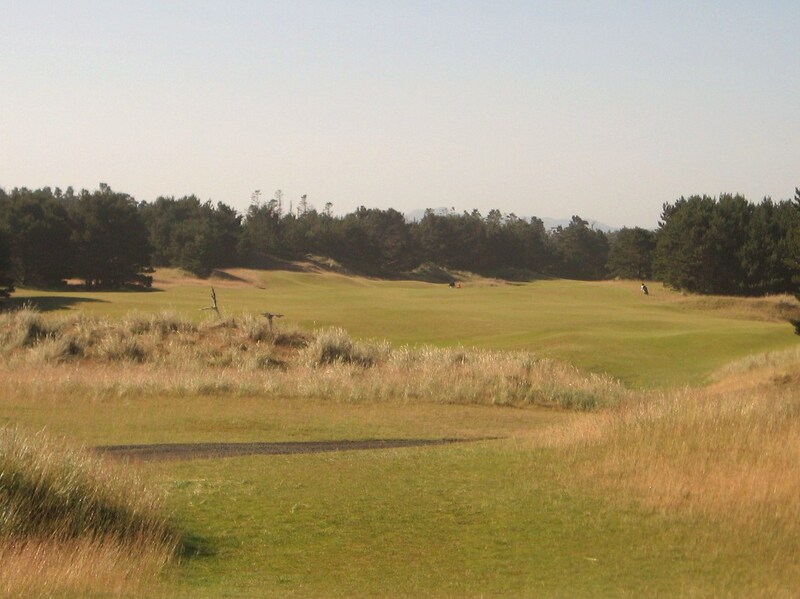 Approach to 9th Lower Green at Pacific Dunes. Since the ninth has upper and lower greens, the tenth must have upper and lower tees. 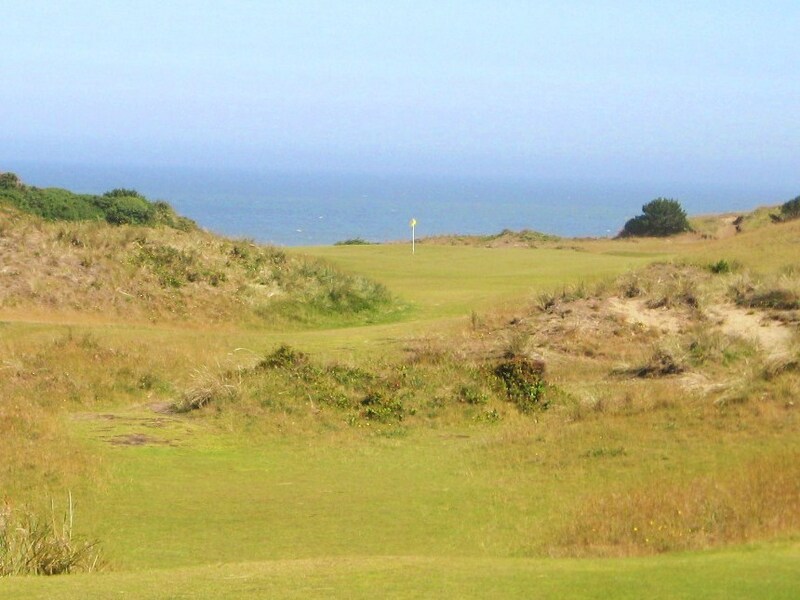 Both tees offer a great view and a challenging shot into a cross-wind. 10th Hole from Lower Tee at Pacific Dunes. The upper tee is much more memorable since it has an incredible view and it can be difficult to judge distance from elevation with a strong wind. With the waves crashing in the background and the wind howling at the top of the hill, the target begins to look pretty small. 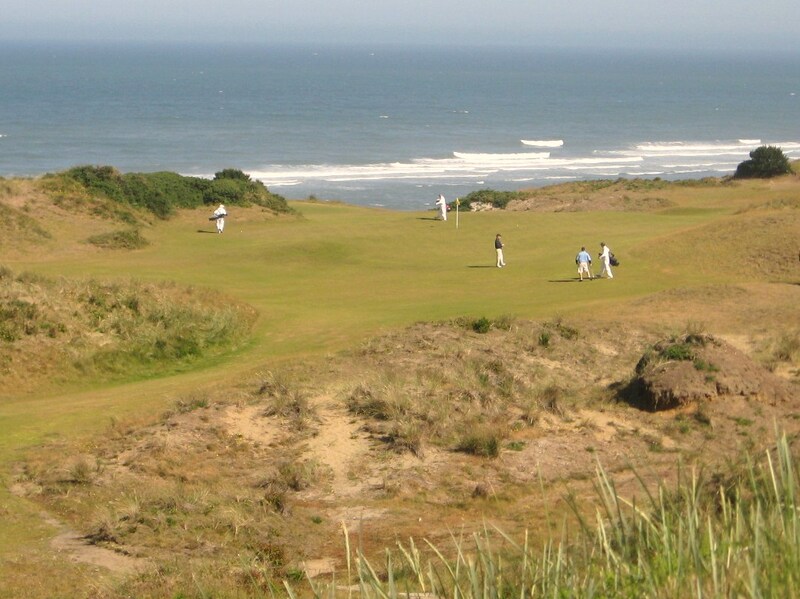 10th Upper Tee at Pacific Dunes. The green is wide open but it is amazing to watch the wind carry tee shots onto the mound on the left side. A safe long iron will provide a great look at birdie because the green is fairly tame in comparison to others found on the course. 10th Green at Pacific Dunes. 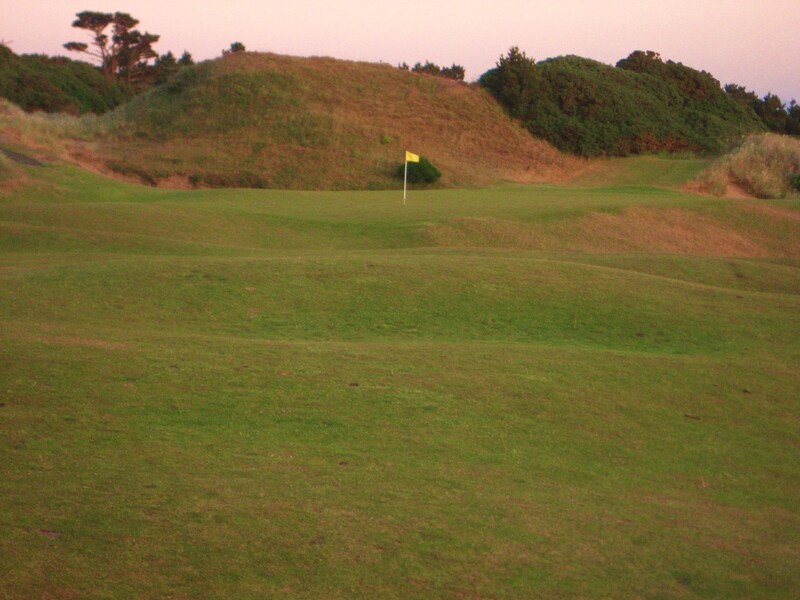 Eleven is a spectacular one shotter with incredible greenside bunkering that provides a lot of distraction off the tee. 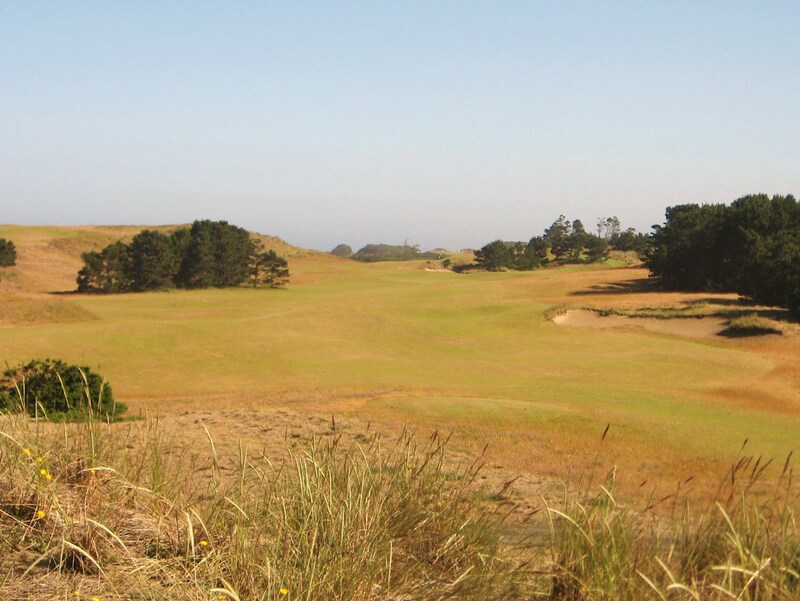 The beach is on the golfer’s left and the Sheep Ranch is visible in the distance, at the end of the wide sandy beach. The tee shot is often into the wind which means a well struck low shot is the optimal play. Despite the length, par is always welcome on this hole. 11th Tee at Pacific Dunes. The greenside bunker on the right side of the photo is quite deep, and the green slopes from right to left, which means a blast must land softly and quickly or risk rolling into the bunker on the other side. 11th Green at Pacific Dunes. On paper, twelve should be a nice breather before the golfer tackles another “all world” hole in the thirteenth, but it can be a real tiger into the wind which is how it usually plays. I recall crushing a driver, hammering a three wood, and then hitting a low six iron into the green because of a 40 mph wind in my face. The fairway bunker straight up the middle is a good target off the tee as it leaves a nice line into the green which is located in front of the large dune on the left side of the fairway. 12th Tee at Pacific Dunes. Anything pulled or hooked to the left will leave a tough shot over the bunker to a fairly shallow green. Bunker fronting 12th Green at Pacific Dunes. 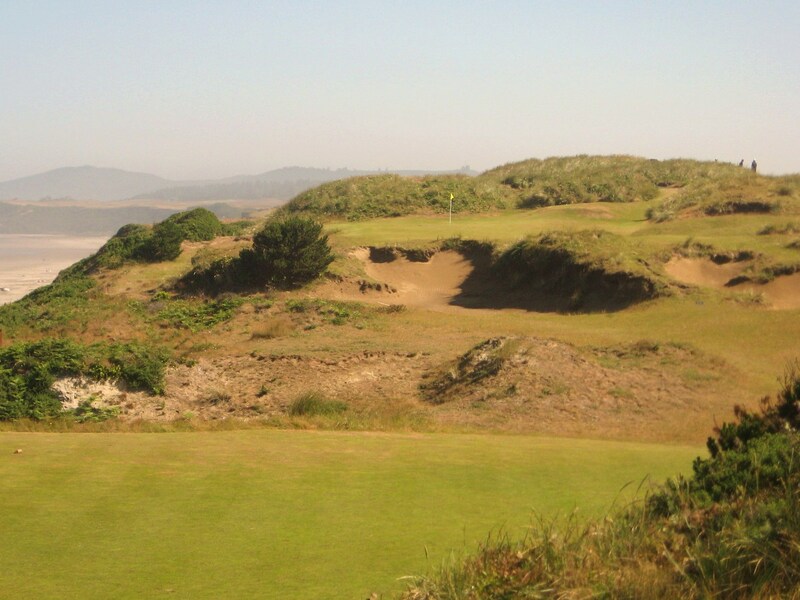 The thirteenth at Pacific and the sixteenth at Bandon probably battle it out for most aesthetically spectacular hole on the property, with the fourth at Pacific and fourteenth at Trails also in the running. The beach is on the left, while a huge dune with a massive blow out bunker lines the right side. Into the wind, this can be a three shotter for many golfers. Getting on the green in two with a 40 mph wind in my face was one of the hi-lites of my weekend at the resort. A flushed driver and then a full three wood from 165 yards landed pin high on the left side of the green. It was an incredible feeling, one of those moments when you are ecstatic that you discovered this crazy game. There is ample room off the tee, but the second is tough since the green is protected by a sloped front that will beat short approaches away. The blow out on the right is a major distraction because it is such a unique and amazing sight. An approach too far left is gone, so playing to the right side of the pin is a good option. 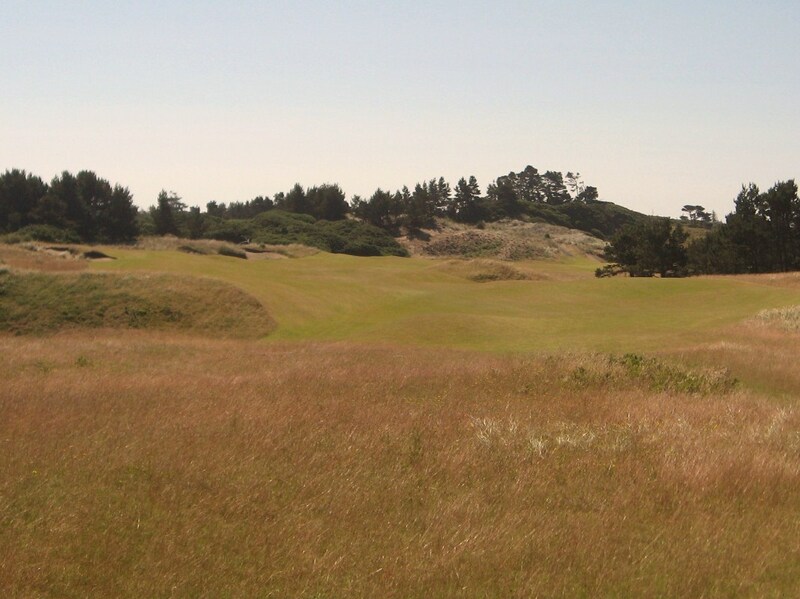 13th Fairway at Pacific Dunes. The green is one of the flattest on the course, so a birdie is possible if you can get there in two. 13th Green at Pacific Dunes. After fighting the wind on ten, eleven, twelve and thirteen, it is nice to have a little break on the short one shot fourteenth. Remember, the wind is now at your back so play to the front of the green and let the ball release to the hole. 14th Tee at Pacific Dunes. The hole looks a lot easier than it really plays. If you miss and get caught in one of the bunkers an up and down will be a formidable task. Right bunker on the 14th at Pacific Dunes. 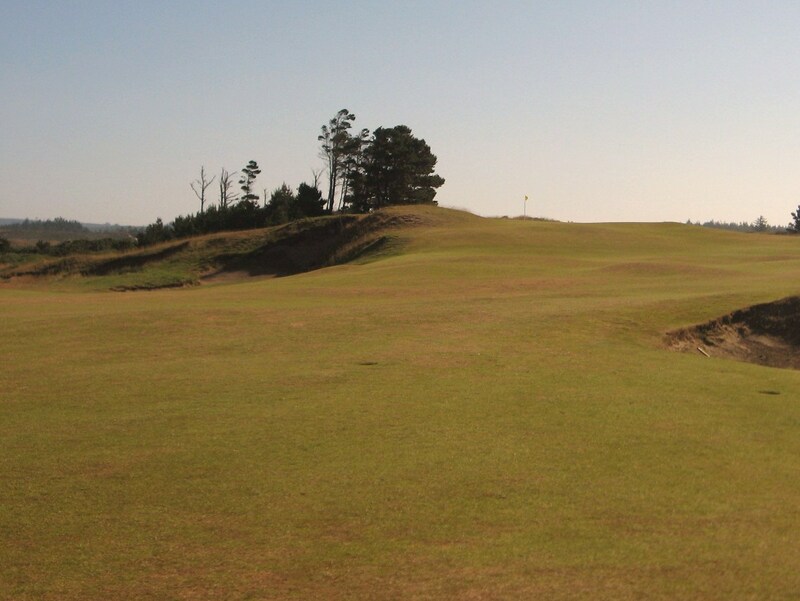 Fifteen is a potential eagle hole if you can ride the wind off the tee and avoid the bunkers strategically placed on the right side of the fairway. 15th Tee at Pacific Dunes. 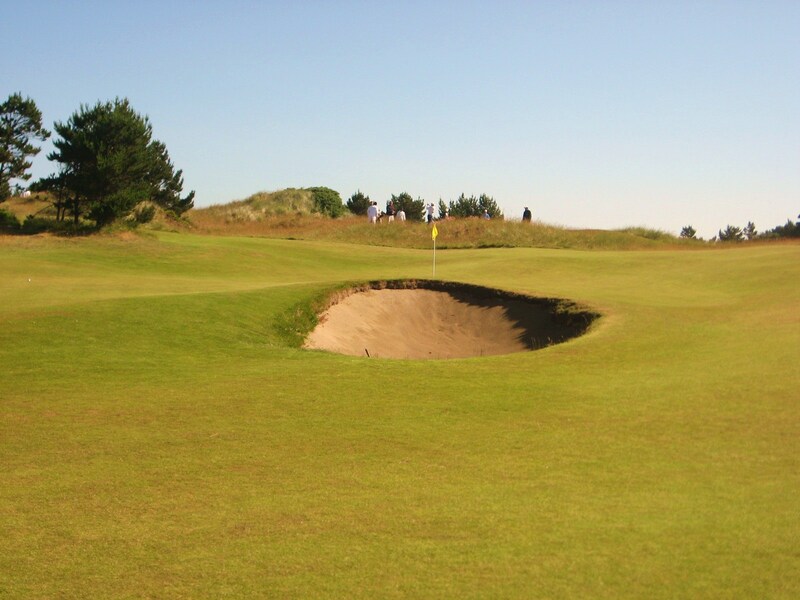 While the green is reachable in two with a good drive, the fairway bunkers are quite penal and the sand is hard packed which makes it challenging to play from. Do not spray your second, or third, right of the green because the knob at the front will frustrate any attempt to chip it close to the pin. Fairway bunker on the 15th at Pacific Dunes. The sunset photo below shows how challenging the green can be if you miss. 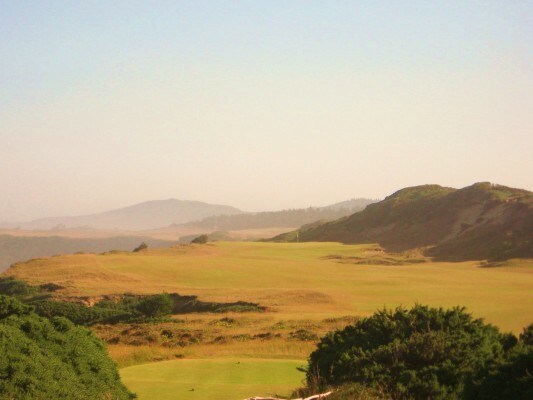 Pictures cannot do justice to the beauty of Pacific Dunes. 15th Green at Pacific Dunes. There are a couple of ways to play this short two shotter. Rip a driver over the left side of the mound straight ahead of the tee and hope you get a bounce up onto the green, or at least onto the face of the hill that fronts the green. 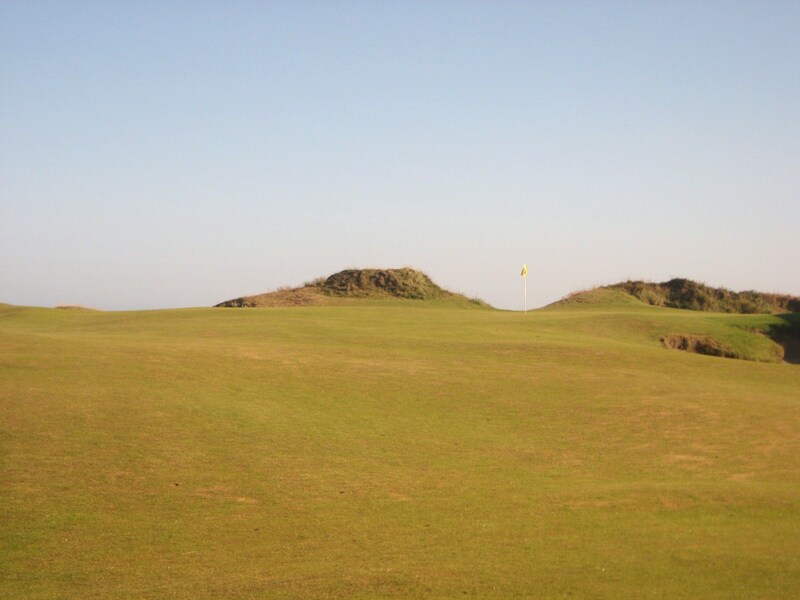 Or, play a long iron down the left side which provides the best line into a very slender green with a couple of deep and nasty bunkers. 16th Tee at Pacific Dunes. From this position, a bump and run up the left side of the fairway is a good option. The bunker on the left and far right should be avoided at all costs. A short right approach will be stuck on the hill which leaves a delicate chip to the green which can easily run into the back bunker. 16th Fairway at Pacific Dunes. 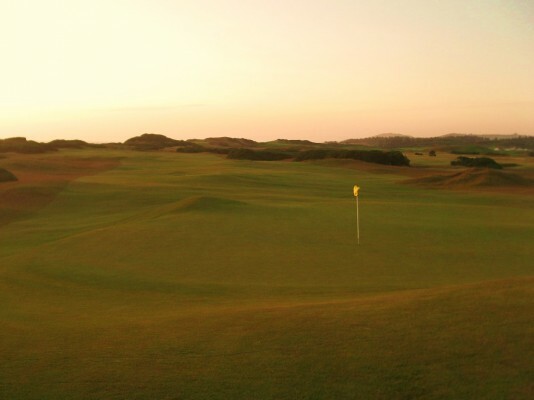 Looking back at dusk, the undulating fairway is brilliant. 16th Green at Pacific Dunes. The seventeenth is a lovely “redan” that has a large front bunker and a putting surface that slopes from right to left. In theory, the ideal play is a nice draw to the front which will roll to a back pin position with the slope of the green. 17th Tee at Pacific Dunes. However, when the hole is playing into a 35 mph cross-wind it is very tough to get the tee shot to release down the slope. Safe off the tee is a good idea, because if you are up on the plateau, it is a fairly straight-forward chip or putt down towards the hole. 17th Green at Pacific Dunes. The eighteenth is a solid finishing hole with exquisite bunker work. The drive should be played just right of the fairways bunkers which will leave a difficult fairway wood to the green or a mid iron lay up. 18th Tee at Pacific Dunes. A lay up from the landing area to the left side of the fairway is wise at it will provide a nice look at the green. 18th Fairway at Pacific Dunes. The undulating ground provides ample challenge on the short approach. 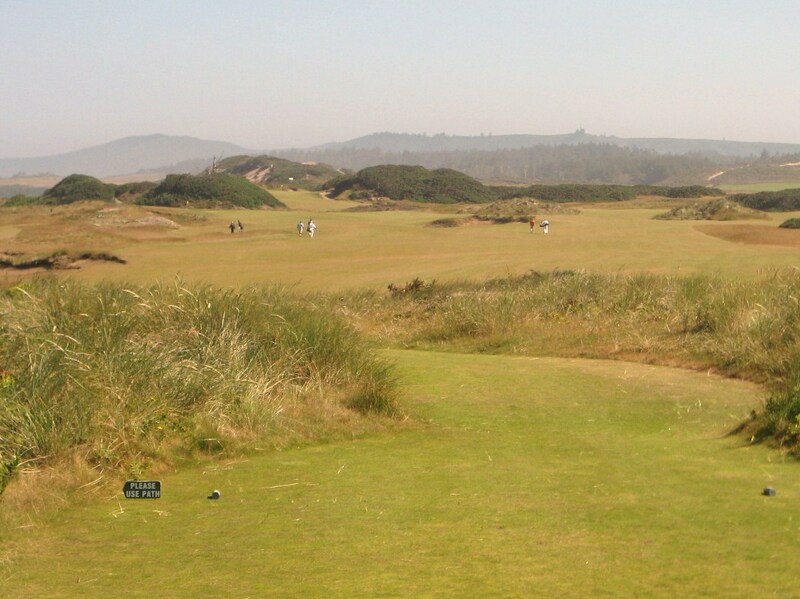 Approach to the 18th at Pacific Dunes. There is actually a little room to land the ball short and run it on. The bunkers on the left and right of the green are difficult to get up and down from so stay out of the sand. It is possible to finish the eighteenth with a birdie but I would imagine that a bogey is a lot more common. 18th Green at Pacific Dunes. 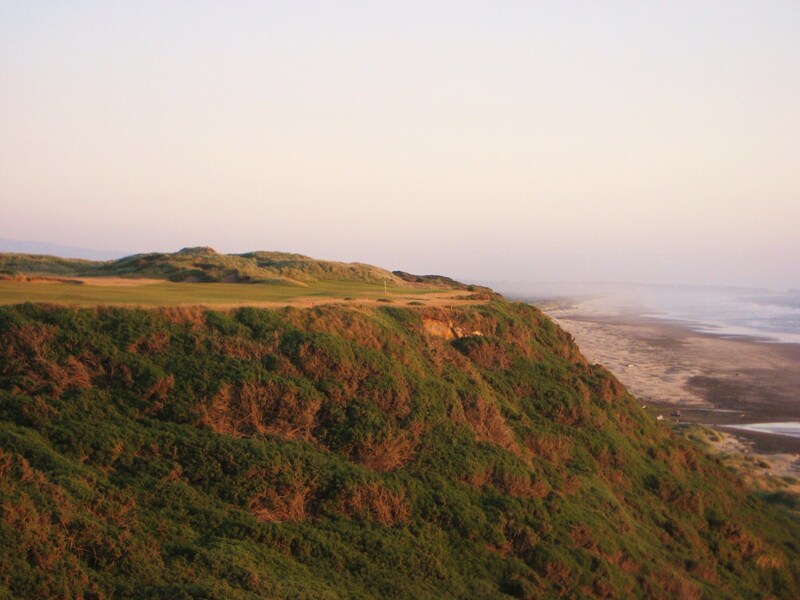 Having finished a round at Pacific Dunes there is nothing a walking golfer would rather do than grab a bite to eat and tee it up again as soon as possible. 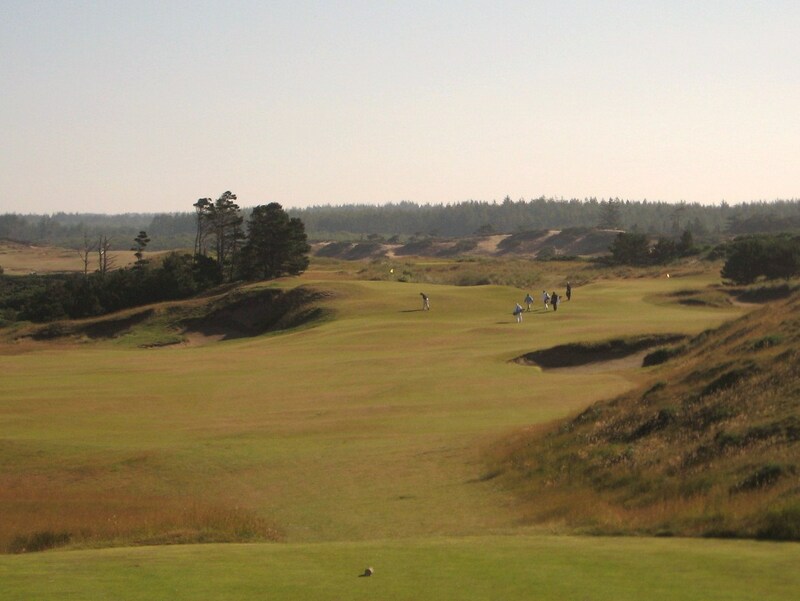 Pacific Dunes receives a 3.5 out of 4 for walkability, it is definitely an easy walk but there are a couple of green to tee transfers that prevent the course from receiving a perfect score. 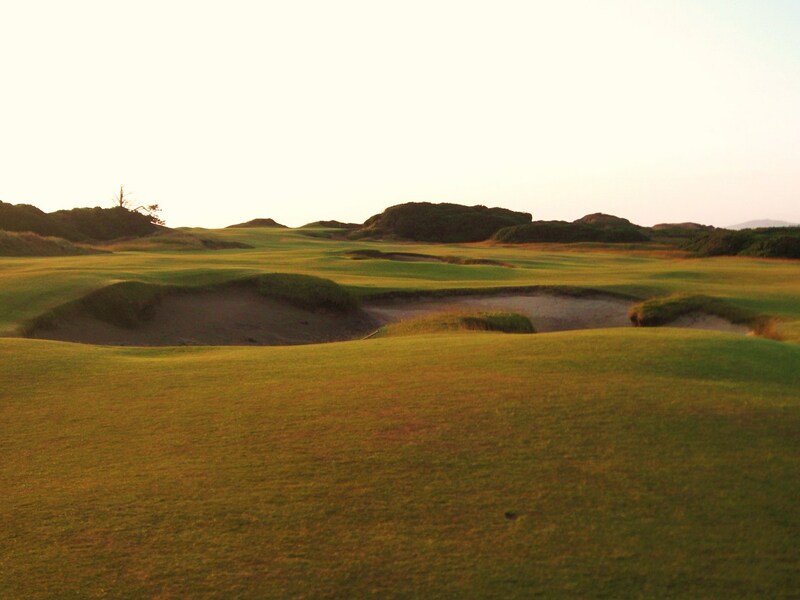 The Architecture and Aesthetics at Pacific Dunes are difficult to match. While the ocean is “only” really in play on three of eighteen holes, it is in view for much of the round. 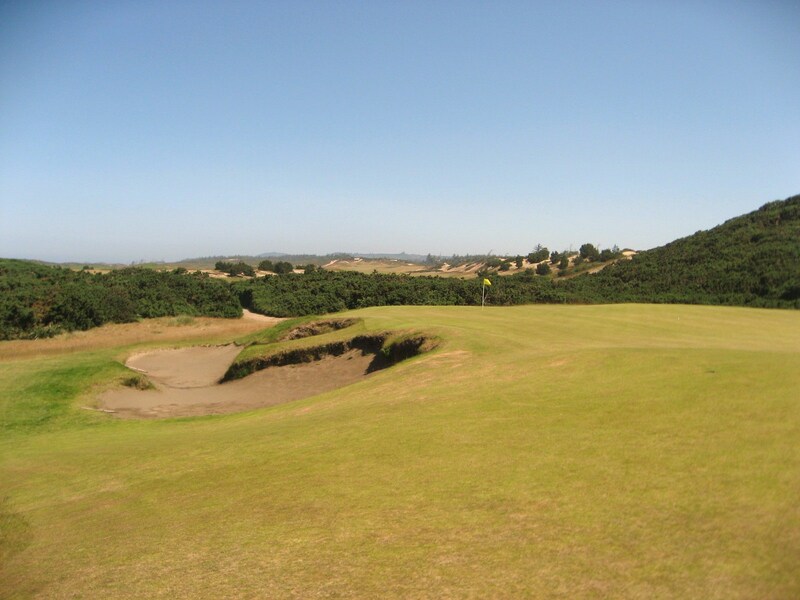 Doak definitely made the most of four, eleven and thirteen, but the strength of the course does not lie in the scenery, but in the excellent routing and minimalist design that rendered so many wonderful and challenging holes. 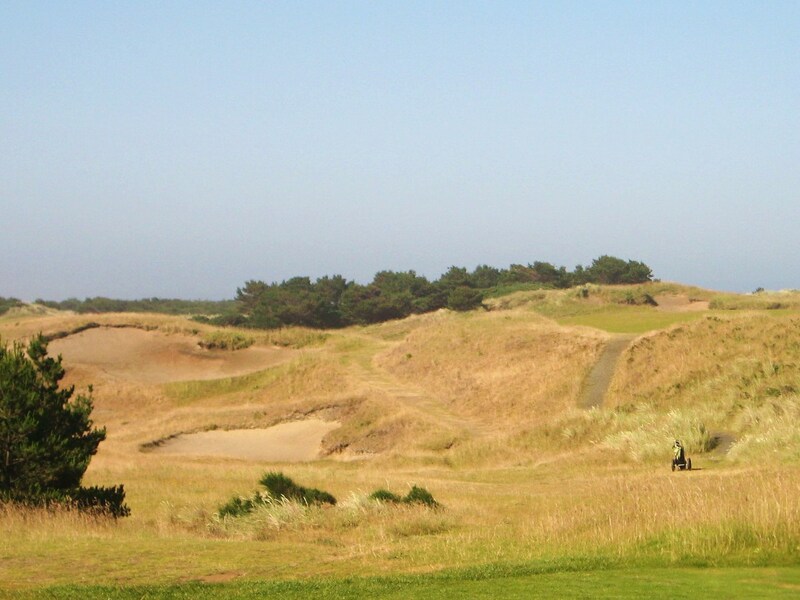 Pacific Dunes is an easy 4.0 out of 4 for Architecture and Aesthetics. 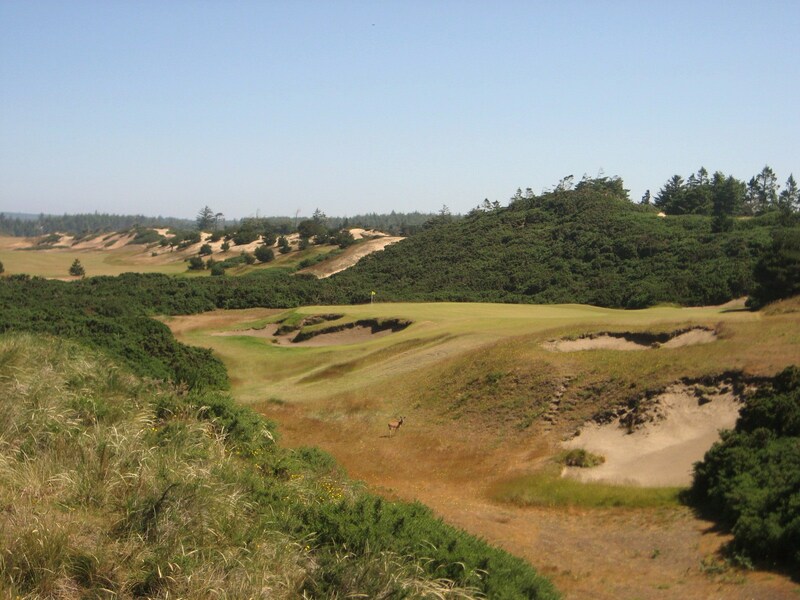 In terms of Playability, Pacific Dunes can be tough, especially in heavy winds, so it was intentionally designed to play shorter than Bandon Dunes because it is not as open and the green complexes are more difficult. 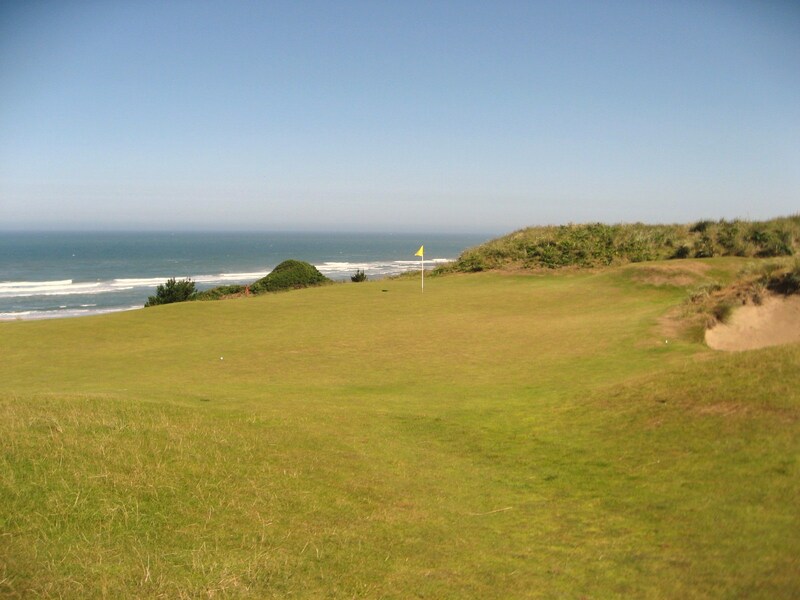 I shot my lowest round of the trip at Pacific Dunes and I would certainly consider it a “fair challenge”. The Strategic element, however, is what makes Pacific shine. There are options galore on almost every shot which makes the round an absolute blast. The architect has you thinking on every hole, with multiple options in play on many, which make scoring possible but not easy. It is a great test of golf and receives a 2.0 out of 2 from The Walking Golfer in this Category. 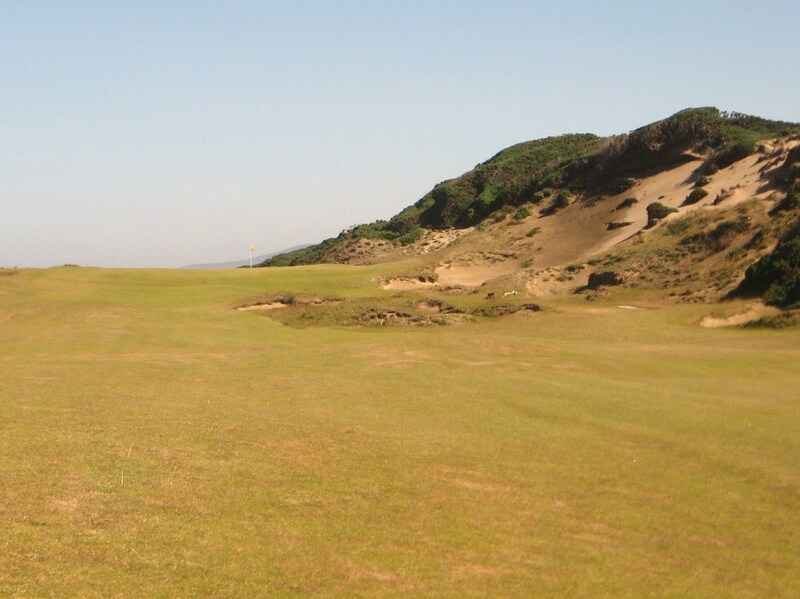 Although Pacific Dunes received a small deduction for walkability, I believe it will be a life enhancing experience for any passionate walking golfer. really looking forward to this test of my skills and a walk in the park with my friends. Great review! The pictures are great and insight to how to get around the course thoughtful and precise. I will be there for 5 days with my wife and two sons later this month. I’ll make sure to comment on our experience.